Super Bowl Truffles! I keep seeing all these AMAZING appetizers and covered dishes suitable for the big game but nothing for those of us with a sweet tooth! I realize that decadent almond truffles might not be the first thing one thinks of for the Super Bowl, but once you check out Super Bowl Truffles, you may be inclined to change your mind. I toasted whole almonds for my first batch and processed them to a perfect consistency. After forming them into balls and setting them in the freezer I dipped them into a bath of melted chocolate. I was so excited to try these truffles….until I actually ate one. They were just too strong for a truffle. I blame the almond’s skin…it made my Super Bowl Truffles bitter. Kind of like the Browns football season. I got smarter on the next round and I used blanched almonds. You can blanch your own, however, I go the easier route and let someone else do this tedious step. The color of the truffle filling was much better this time around without the skin and guess what? That nasty bitter taste went away. Even though my beloved Browns are, once again, sitting on the sidelines, I will not let that put a damper on one of my favorite holidays. This Super Bowl will be deliciously sweet and fabulous with Super Bowl Truffles. Maybe next year, Cleveland. I will be there, as always, cheering for you whether or not you fumble your way through the season! Place the almonds and sugar in a food processor fitted with a metal blade. Process until the nuts are finely chopped. Add the cream and butter and process until smooth. Line a baking sheet with aluminum foil. Use a small cookie dough scoop to scoop the filling onto the pan. Freeze for 15 minutes. Roll the balls between the palms of your hands to make them smooth. Return to the freezer until the chocolate is melted. Melt the chocolate, either on the stovetop of in the microwave, until almost all of the chips are melted. Add the coconut oil, if using, and stir until completely smooth. Dip each filling ball into the melted chocolate and return to the pan. 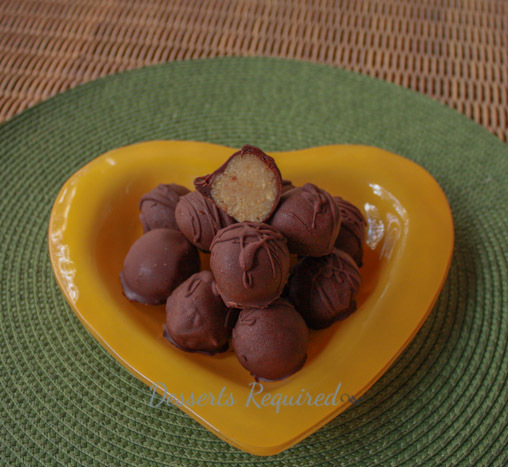 Drizzle any leftover chocolate over the covered truffles. I hate puns, but these do look, “Super!!! !” How fitting! Even better is that they look easy. I LOVE puns and you scored a touchdown with yours! It was my pleasure to experiment for both of us! Enjoy!! I love that these truffles are so different from all the others I’ve been seeing. Can’t wait to put them on our dessert bar for the game. Sharing your recipe! Thank you so much! I greatly appreciate your sharing the recipe and know your friends will enjoy ‘bellying up to the bar’ for these! Yeah, our beloved teams are out, too. And glad there is someone else planning some sweet treats for Super Bowl Sunday 🙂 Your truffles sound marvelous. Wish I was still down your way…this weather is getting OLD!!! Even without our beloved teams, we will still LOVE the Super Bowl because we both LOVE the FOOD!!! These look wonderful Betsy! I love peanut butter and chocolate but the almond filling sounds even better! Thanks so very much! It was fun trying a new filling. They really are very yummy!